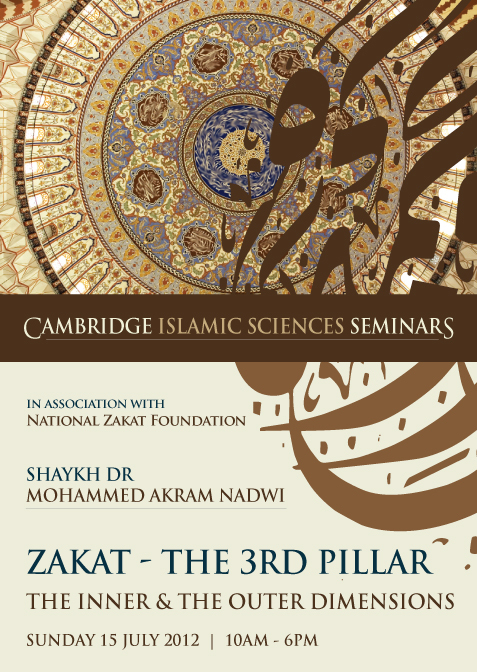 Cambridge Islamic Sciences: Zakat - What Is The Purpose? Zakat is a pillar of Islam yet it is little understood. This is not just with regard to the possible complications in calculating Zakat in modern times but mainly because its meaning, purpose and goals have been misunderstood. People generally think that Zakat is there to "purify the wealth" and "alleviate poverty" but these are not the main objectives. Zakat is there for much greater purposes than these. It is these higher purposes or the inner dimensions of Zakat that make Zakat so important that it is one of the pillars of Islam, equivalent to the Salah (Prayer). Zakat is almost always mentioned alongside Salah in the Qur'an. What is this special relationship between Zakat and Salah? And what are the higher purposes of Zakat? MEOC is pleased to present the forthcoming important seminar on Zakat in association with the National Zakat Foundation (NZF). This seminar is delivered by one of the foremost scholars and thinkers of the western world today: Shaykh Dr Mohammad Akram Nadwi of the Oxford Centre for Islamic Studies, Oxford University. No doubt, the seminar will address the outer dimensions or the practical aspects of Zakat. But the focus of the seminar would be the higher purposes or the inner dimensions of Zakat which, if really understood, make Zakat a spiritual goldmine (for self purification - tazkiyyah) and a miracle of Islam. MEOC is pleased to present this important seminar on Zakat in association with the National Zakat Foundation (NZF). Launched in 2011, NZF is a groundbreaking initiative which aims to utilise Zakat funds and voluntary donations collected in the UK for the benefit of local, deserving recipients. This group includes some of the most vulnerable members of our community, including widows, orphans, refugees, the aged as well as the homeless. The work of NZF covers five core areas which together form an end-to-end service for the Muslim community in the UK with respect to Zakat: Awareness, Education, Calculation, Collection and Distribution. For more information, please visit www.nzf.org.uk. NZF is an initiative of Mercy Mission UK, charity number 1122922.